Thanks to all competitors and marshals for a successful event, provisional results are available below, please let me know of any discrepancies. Once validated age group specific tables will also be published. Thank you for your interest in the Exeter Triathlon Club 2018 Aquathlon series races. Race information can be found below. 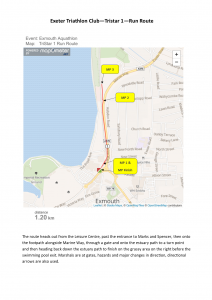 Series entry can be found at the bottom of the table and is accessed through the Sidmouth entry link. *This year for the first time we are using the BTF Online Entry system for the discounted series entry, this is accessed through the first race of the series – Sidmouth, following the links from there, either as a BTF member or not. Non BTF members will have £3 added to the price. An aquathlon is a swim > run event. The races feature continuous rolling starts. Each competitor will start their race when a place becomes free in the pool. 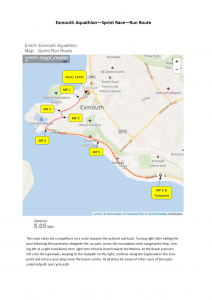 The swim is held in a heated swimming pool; transition takes place poolside; the run route is on quiet pavements / roads or, in the case of Sidmouth, along a path through a park. Start times will be published on this page. Please be at the venue at least 30 minutes prior to your scheduled start time in order to register and get ready to race. You will receive your race number, a numbered plastic bag (for your transition belongings that you do not want to take on the run), safety pins to pin your race number to your vest / t-shirt (if not using a race belt). You will get your race number written on your right arm and left leg in permanent marker. Route maps will be on display. 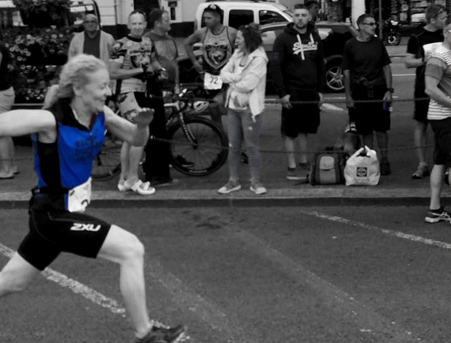 Exeter Triathlon Club members will be on hand to answer any questions you may have. Change into your swimming gear and be ready at the poolside five minutes prior to your scheduled start time. If you get cold easily, take something warm with you to put on while you wait for a start slot. You can leave these items in the plastic bag at your transition spot and reclaim them after you finish your race. Please be make your way to the pool side. When called forward by the pool manager take your transition / running kit1 to the transition area and set it up ready for when you exit the pool. Please be mindful of other competitors who have started their race; give way to them if necessary. Bring the numbered plastic bag with you (that you received at registration). Use this to line the container provided at your transition spot so that you have somewhere to put your goggles, towel, etc. prior to starting your run. After starting your run, your belongings bag will be sealed and removed by one of the pool marshals. You can collect this from them after you finish your race. It’s important that the number written on your arm / leg is the same as the number on the bag. Please check this is the case otherwise you will have to wait until the end of the race to ensure that everyone has their own belongings before we can return yours to you. Make your way back to the start area and join the start queue. Ensure that you have your goggles on and are ready to start. When it is your turn to start the swim, the pool manager will call you forward to the end of the lane that you will swim in. The lane marshal will give you a coloured swim cap to put on (so that they can identify each competitor in their lane). The lane marshal will record your name and your race number. You will be asked to enter the water. Please be mindful of the other competitor in your lane and stay on your side of the lane. You will be given a 10 second countdown. Start your swim2 when the pool marshal tells you to go. Swm the designated distance for your race. A lane marshal will keep track of the number of lengths you have completed and your total swim time. Two lengths (50m) before the end of the swim, the lane marshall will place a float in the water to indicate that you have two lengths remaining to swim. When you have completed your swim, exit the pool and walk3 to your transition spot by the side of the pool. Put on your running kit, placing any belongings you do not want to take on the run in the plastic bag, and walk3 to the pool exit. You must be wearing your top and your race number must be clearly visible at chest / abdominal height before you exit the building to start the run. 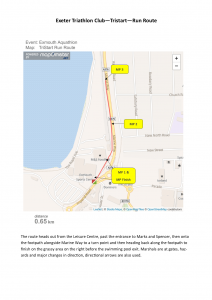 The building exit marshal will record your race number and the time that you start your run. These timings will allow calculation of your transition time. Be mindful of any instructions that the building exit marshal gives you. The ground can be slippy with the drips of water from previous competitors. Please take extra care at this point, especially where the start of the run is on grass. Follow the run route as shown on the course map. There will be run marshals along the run route. Follow any instructions they give as you pass by. If you need any emergency assistance during the run make this known to the nearest available run marshal and, if they can’t perform the first aid themselves, they will phone for assistance. Your race will be completed when you cross the finish line. The finish line marshals will record your race number and your finish time. Collect your belongings from the pool marshals. 1 Transition / Running Kit. Mandatory items are: shoes, a vest or t-shirt (if not wearing a tri-suit) and race number (attached to your vest or attached to a race belt). Optional items are things like socks and a towel. 2 There will be two people swimming in a lane. You will have one side of the lane to yourself. Do not move to the other side of the lane when you reach each end. 3 Running / jogging on the pool side will lead to immediate disqualification. Sandy Lane, Dawlish EX7 0AF. Parking is available at the leisure centre. The junior run route is a 600m circuit of the playing fields adjacent to the leisure centre. Depending on their age group, the competitor will complete between one and four laps of the course. Ham Lane, Sidmouth, EX10 8XR. Parking is available in the two public car parks (chargeable) adjacent to the leisure centre. Cornwall House, St German’s Road, Exeter EX4 6TG. Cornwall House outdoor pool is at position 80 on the Exeter University Streatham Campus map. Parking is available in car park B (see Exeter University Streatham Campus map). This is a ten minute walk from the pool. 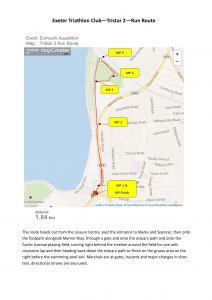 “The Events” – 2018 Aquathlon Series of three races described in the race information. “The Participant” – Individual(s) who wish to enter or have entered The Event. By completing the designated entry process participants are agreeing to abide by the following terms and conditions. It is the Participant’s responsibility to provide accurate and truthful information when completing the entry process, any errors in data entered is the responsibility of the Participant. If at any point the organiser discovers that the Participant has provided false or inaccurate personal information, or that the information provided means that the participant is ineligible to participate in the Event the organiser reserves the right to refuse entry or disqualify the Participant, without any refund of the entry fee. Once payment is received and entry is confirmed, the fee is non-refundable. Entry to the event will be confirmed by email to the email address provided by the Participant only upon completion of the entry process. If the Participant wishes to withdraw from the Event they must do so by informing the Organiser in writing by email to aquathlons@exetertri.co.uk. The email subject title must be “WITHDRAWAL”. No other method of withdrawal is accepted by the Organiser. Providing the withdrawal notice is provided within the applicable time limits the Organiser will confirm the withdrawal by email to the Participant within 5 working days. If no response to the withdrawal request is received the Participant should phone the Organiser on 07730 015820. Withdrawing from the Event is irrevocable; if notice of withdrawal is given under this section then the Organiser will remove the Participant’s name from its start lists and other official documentation. No refund will be due. Transferring or swapping of entries risks that the Organiser’s Event insurance will be voided or subject to limitations and conditions or limitations not anticipated by the Organiser. In this and in other ways attempting to swap entries creates additional risks for the Event and for the other Participants. Any participants and other involved individuals who are found to have swapped their entries will be banned from participating in all future events promoted by the organiser, and referred to the relevant Home Nation Association who may choose to implement further disciplinary action. The race information is published on the Event website. It is the Participant’s responsibility to read, understand and abide by the race information. 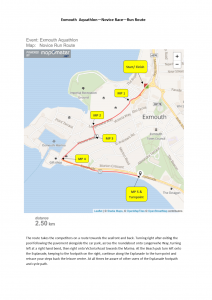 The Organiser reserves the right to alter the race information at any time without notice. Participants must have photo ID (driver’s licence, passport, Triathlon membership card etc) to register for the event and be issued their race pack. The Event is run in accordance with British Triathlon Federation Rules, which can be viewed at www.britishtriathlon.org/about except where stated i.e. elite races. It is the Participant’s responsibility to know and abide by the rules, and to ensure their equipment and its use complies with the rules. If the Event is cancelled for reasons beyond the organisers control, including without limitation fire, storm, act of terrorism, “act of god”, serious medical incident, then the Participant will not be entitled to any refund or compensation of other losses and any refund that the Organiser decides to make will be within the absolute discretion of the Organiser. Participation in the Event is at the Participant’s own risk. The Participant irrevocably agrees to hold harmless, indemnify and reimburse the Organiser from and for any sum, costs or expenses (including legal and professional fees) incurred, payable or paid by the Organiser to any person (including the Participant and/or any of the Participant’s insurers) in connection with any accident, loss, damage or injury (including death) arising out of the Participant’s attendance at and participation in the Event or any part thereof (except where any such injury or death is caused by the negligence of the Organiser or any of its employees) and the Organiser’s liability to the participant is excluded to the fullest extent permissible by law. It is the Participant’s responsibility to ensure they have the right level of physical ability to complete the Event. If you know or are concerned that you have a medical condition which might interfere with your safe participation in the Event, before you enter you should seek advice from a relevant medical professional and follow that advice. Please see our Health Commitment Statement for more advice (below). (a) The Organiser requires a record of each Participant’s registration details including third party emergency contact details for internal administration purposes in order to properly conduct and to safely administer the Event. (b) The Participant agrees to receive emails from Exeter Triathlon Club Aquathlons and British Triathlon and the Home Nation Associations containing event information and event updates before and after the event. (d) The publication of the official start lists and results of the Event, and their inclusion in British Triathlon Federation’s historical results database as well as other reasonable statistical purposes. For the avoidance of doubt, the following Participant information shall be published within Event start lists and results: Name, Age, Age Category, Gender, Club and membership number as appropriate. In addition to this data, Date of Birth shall be passed to British Triathlon to enable matching of results to individual membership records, but will not be publicly published. (a) The Organiser will use the Participant’s contact data submitted on the Online Registration Form or otherwise to send the Participant information by e-mail and/or SMS relating to the Event, other events and any further categories of news and promotional information as the Participant may have requested on the Online Registration Form. (c) The Participant accepts that the Event’s appointed photography partner will be able to email them post event regarding the purchase of participant photos from the event. We will respect your personal decisions, and allow you to make your own decisions about what exercise you can carry out. However, we ask you not to exercise beyond what you consider to be your own abilities. We will make every reasonable effort to make sure the Event is organised to accepted safe operational standards for you to enjoy.We will make all reasonable steps to ensure first aid is available at the Event to an industry standard. If you tell us you have a disability which puts you at a substantial disadvantage in accessing our event, we will consider what adjustments, if any, are reasonable for us to make.